"Le Pianore" est composé d'une villa d'hôtes, d'une villa résidentielle et d'une ferme biologique de 50 ha. La villa Campostefani est la villa principale pour les invités. Elle comprend, avec le cottage Fienile, dix chambres spacieuses et une cuisine entièrement équipée avec salle à manger attenante. Il y a de nombreux espaces de vie séparés, à l'intérieur et à l'extérieur, avec une grande place pour les invités à s'installer et à se faire à la maison. Assurez-vous d'allumer le barbecue et le four à pizza au feu de bois. Plongez dans notre piscine pour répit de la chaleur de midi et profiter de se prélasser sur les chaises longues jusqu'au coucher du soleil, en regardant le ciel devient rouge et se sentir la fraîcheur descente d'air du soir. Il y a une connexion Wi-Fi pour tout le monde, une petite bibliothèque à lire à votre guise et une télévision par satellite dans la salle familiale à l'étage. Il y a aussi une table de ping-pong, un filet de volley-ball, des balançoires et un gymnase dans la jungle pour les plus petits. Les jardins de Le Pianore sont une aire de jeux pour les adultes et les enfants. Châtaigniers, chênes et cerisiers offrent beaucoup d'ombre lors des balades, tandis que la lavande et le thym, les roses, les jasmins et les genêts parfument et animent le paysage. Nous entretenons avec amour une ferme de 50 ha avec des légumes et des fruits biologiques et faisons notre propre vin, miel et huile d'olive. Vous êtes invités à venir explorer notre jardin et cueillir des produits frais à déguster pendant vos repas. Le Pianore offre tous les équipements et les infrastructures nécessaires pour accueillir des retraites et des ateliers de qualité dans un cadre magnifique et paisible, idéal pour l'exploration créative et la pratique spirituelle. Nous répondons aux groupes pratiquant une variété d'activités, à la fois méditative et dynamiques: de yoga et les arts martiaux à la musique, le théâtre et la danse. Sala San Francesco, construite dans la même pierre toscane et le style vernaculaire que les autres villas, est un espace d'accueil avec parquet en chêne et de grandes portes qui ouvrent sur des vues lointaines sur la piscine et les jardins. Un studio multifonctionnel avec beaucoup de lumière naturelle, il est généreusement équipé de tatamis, tables, chaises et couvertures ainsi que d'un système de son. Pour ceux qui souhaitent pratiquer dans la nature, il y a une grande terrasse et un porche ombragé à côté du studio. Dans les mois les plus froids, l'espace est maintenu chaud et confortable par un poêle à granulés. Un loft séparé offre un espace intime pour les petits groupes ou les traitements individuels. Alors que l'espace se prête à la réflexion calme et la méditation, les tatamis de mur-à-mur en fait également un dojo idéal. deux salles à manger | deux espaces de vie avec cheminées | une cuisine entièrement équipée | deux kitchenettes | coin barbecue | four à pizza au feu de bois | buanderie avec machine à laver | chauffage central plus un poêle à bois | connexion internet sans fil | piscine! Villa Maladina est notre maison de campagne, c'est où nos quatre enfants ont grandi et où nous vivons actuellement. A 5 minutes à pied de Villa Campostefani, nous sommes à votre disposition pour tout besoin spécifique, recommandations, ou vous êtes toujours invité à nous rejoindre pour une tasse (ou deux) de café. Les salles de bains sont équipées de majoliques carreaux de céramique fabriqués à la main ou en marbre travertin. Some holidays are about escape. At Le Pianore we felt more like we were being invited into a whole way of life. It's a life where food, family, slowing down and switching off are at the heart of everything. We were there for an extended family gathering (15 of us) so it was perfect to have so much space for everyone to do their own thing, then come together for great al fresco feasts and fun in the swimming pool. We picked fresh vegetables from the farm and learnt how to cook proper pizzas in the wood fired pizza oven. Elena, Erica and Francesco could not have been more welcoming, helpful or infectiously passionate about their home and the surrounding areas. I have been going to Le Pianore for 16 years, first with my family as they grew up and now on Ladan's annual yoga retreat which is firmly in the diary every summer solstice! Elena and her wonderful husband, son and daughter run the farm in way that makes everything feel natural and effortless (as well as beautiful and delicious). It is utterly peaceful and 'balm for the soul' as my friend always says when we go. The position of the house is fabulous with valley views all around; the rooms are rustic and charming; the food is incredible. And of course Elena and her brother make all the wine, plus the olive oil, honey, mulberries (right outside the house), herbs, tisanes etc etc. Too, too wonderful not to go every year! Thank you Elena! I met Elena the owner of Le Pianore in London and right from the start I was struck by her warm and rich personality. I have eagerly organised my first yoga group for a yoga retreat at Le Pianore three years ago and since then I have not missed a year. As soon as you step in on Le Pianore grounds you experience a deep feeling of calm and tranquillity. The views are absolutely stunning and the villas with the grounds have everything you need for a relaxing holiday. The large yoga studio is a beautiful open space equipped with everything you need for a yoga retreat of dance or meditation holiday etc. You can choose to stay during the day at the villa or go for a trip, in any case Elena and her family will give you lots of advice on what to see and do around the area. Elena has been extremely helpful to assist me with running the retreat smoothly and she personally connects with each guest making sure they are happy to such extend that they will even cook your favourite dish. Besides the amazing guests I arrived with my husband and 18 months toddler who also came with us last year when he was 5 months. They always has been amazingly helpful with providing everything our son needs (cot, high seat, special meals) and beyond that. My husband who is a very fussy eater has been getting special meals too and I have not even asked for it. That is the attention to detail you will have at Le Pianore. Food and wine is delicious and the majority grown in the family's farm down the hill. We had a generous tour of Elena 's house and farm this year and it is inspiring and humbling to see the love and dedication gone into everything around it: amazing garden, vineyard, olive grove and of course her two donkeys and two horses. All the produce is organically grown and the whole estate 90% electricity self sufficient. The highlights of the holiday this year must be: Enrika's deserts especially panna cotta, the birds singing in the night, the deer who came close to the house one evening, the two elusive white horses, the two ducks on the blue lagoon like lake and of course the two lovely donkeys whose touch of ears is like meditations. Please ask for info on the Alpaca farm. We had an absolutely amazing time there. Despite the growing family I plan to make it possible and return to Le Pianore next year and look forward to see Elena, Enrika, Rina and all the team. 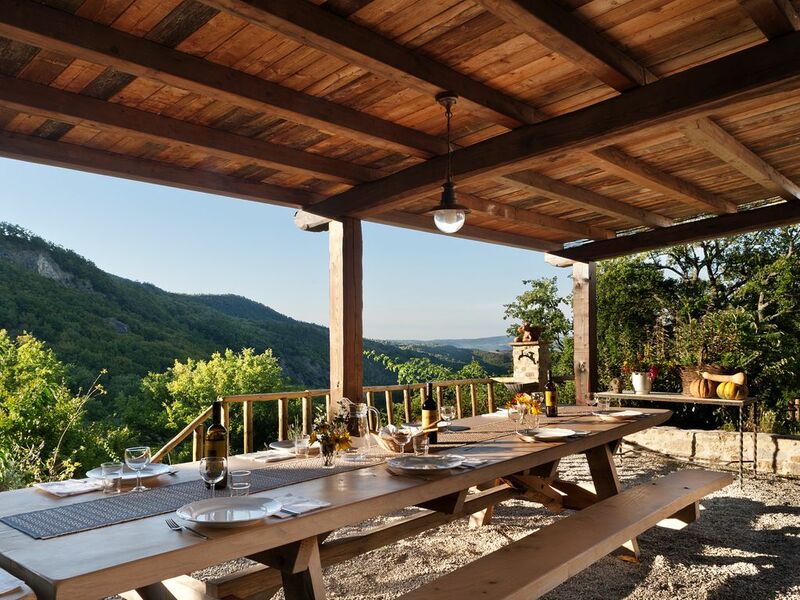 Le Pianore is a really magical place located in one of the most beautiful places you can imagine, set in the middle of the hills of Tuscany, the ideal place for a retreat and to recharge your batteries from the hustle and bustle of modern life. This is the second year that I have been there. I loved it the first year nd enjoyed it even more the second year. The owner, Elena Basile, has to be one of the most remarkable women I have ever met – she had a dream to create this wonderful place in Tuscany and continues to further develop it to make it one of the very best places that I have ever been to. That is due to her passion for Le Pianore and her vision to continually make it the perfect place for a holiday and a yoga retreat, which was my reason for going there. The rooms are all unique – warm and comfortable with individual charm and everything you need to help you relax – and if you need it, there is also wifi! You are woken up in the morning with birdsong and breath-taking views. The food is amazing – most of it from ingredients grown in Elena’s organic kitchen garden which she manages with her son and expertly cooked by her daughter Enrica, who is a brilliant cook and the queen of desserts. My two trips to Le Pianore were for a yoga retreat – you cannot imagine a more beautiful place with a spacious and well equipped yoga studio. I arrived exhausted from the hustle and bustle of life in London but with 1 ½ hours of Yoga in the morning followed by a delicious brunch and then again 1 ½ hours of yoga again in the evening followed by dinner, I left feeling completely rejuvenated and revitalised. Le Pianore is not only ideal for yoga – it is also a perfect location to visit Tuscany and Elena and Enrica gave us lots of tips of where to go within either 30 minutes or an hour’s drive. On days when we did not want to venture out, there is plenty to do just relaxing by the pool or taking a walk up to the next village. If you are looking to recharge your batteries in a beautiful location, Le Pianore is the place to go – either join a yoga group or just rent out the place with a bunch of friends – you will come back all the better for having visited Le Pianore and spent a week in the company of Elena and her family. thank you from heart. You gave so much detailed vision of your stay and it has been so kind and nice of you. Joyce anytime you'll be back, it will be for you a bit like going back home, and for us as wellcome a good friend. Le Pianore is a truly magic place! You will find yourself in the most amazing nature and welcomed by Elena with warmth and generosity. My time there was really special, the landscape around the villa invites you to relaxing and refreshing walks, the accomodation is beautiful in every detail, food and wine are just superb. Elena and her family are impeccable hosts and wonderful people, I can't reccomend enough a stay in this corner of paradise. Ideal for a romantic holiday as well as for a group of friends. Depuis les collines de la Val d'Orcia à la côte de la Maremme, en Toscane est un paradis pour les randonneurs, les cyclistes, les bons vivants et les amateurs d'art de même. Avec Le Pianore que votre base, vous êtes parfaitement positionnée pour explorer les nombreuses richesses de ce pays des merveilles naturelles et culturelles. Nous pouvons organiser des randonnées guidées, de l'équitation et le vélo, excursions à proximité des thermes, des abbayes romanes et jardins de sculptures. Vous pouvez visiter un vignoble et siroter un Brunello gras accompagné d'une variété de fromages locaux ou apprendre à faire des pâtes comme nonna ici dans notre cuisine de la ferme. Quelle que soit votre préférence, nous vous aidons à organiser les activités qui feront de votre séjour encore plus magique. Les villes d'intérêt à portée de Le Pianore incluent Montalcino (25min), Pienza (45min), Sienne (1heure) Florence (2heures) et Rome (2heures). Musique, art et festivals de théâtre ainsi que les célébrations folkloriques sont en cours pendant les mois d'été. Stretching pour 4 km le long de la réserve naturelle de Monti dell'Uccellina, Marina di Alberese est l'une des plages les plus sauvages et les plus vides en Italie.